Sencha Blog 의 글을 번역 합니다. Our focus for Sencha Touch 2.2 was to expand the footprint of device support to give you, our community, the broadest selection of devices to run your apps. In this release, we’ve enhanced our support for BlackBerry 10 devices and added support for Internet Explorer 10 for Windows 8 and Windows Phone 8. We’ve also made some big changes to improve performance in lists, themes, new debugging capabilities, added the new AnimationQueue feature, and more. This is the best Sencha Touch yet. 우리가 Sencha Touch 2.2 에서 초점을 맞춘 것은 여러분(커뮤니티)에 앱을 구동할 수 있는 기기의 폭을 최대한 확장해 드리는 것입니다. 이번 배포에서, 우리는 블랙베리10 지원을 강화하고, 윈도우8과 윈도우즈폰8용 익스플로러10 지원을 추가했다. 우리는 또한 리스트 성능향상, 테마, 새로운 디버깅 기능, AnimationQueue 기능을 비롯하여 많은 부분에서 큰 변화를 만들어 냈습니다. 이것은 지금까지의 최고의 Sencha Touch 입니다. 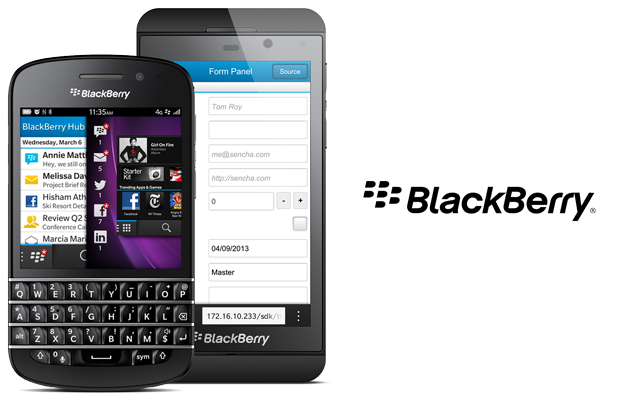 Sencha Touch already runs great on the recently released BlackBerry Z10 and also runs great on the forthcoming BlackBerry Q10. For Touch 2.2, we partnered closely with the folks at BlackBerry to take it even a notch higher, and now your Touch apps have everything they need to run lightning fast on BlackBerry 10 devices. You’ll find that the right markup, the right styling, and the right parameters for things like touch handling are all in place. Sencha Touch 는 최근 발표된 블랙베리Z10에서 이미 동작하고, 그리고 또한 앞으로 나올 블랙베리Q10에서도 동작합니다. 터치 2.2에서 우리는 심지어 더 높은 수준을 취하기 위해 블랙베리 관계자들과 긴밀히 협력했다. 그리고 이제 여러분의 터치 앱들은 블랙베리에서 번개처럼 빠르게 작동하기 위해 필요한 모든것을 갖추었다. 여러분은 적절한 마크업과 적절한 스타일링 그리고 터치 핸들링같은 곳에 옳바른 파라미터가 위치해 있음을 알게 될 것이다. Sencha Touch 2.2 is the first version that works on Microsoft’s Internet Explorer 10 browser — goodbye WebKit dependencies! For the past few months, we worked with the Microsoft Open Tech team to remove all the WebKit specific code in Sencha Touch (or only use it when we’re on a WebKit browser). Under the hood, we’re using standard CSS3 flexible box layouts and HTML5 DOM selectors to get all of our layouts and rendering working beautifully wherever IE 10 runs (such as the Surface, Windows Phone 8, and Windows 8 devices). We also built a new Windows 8 style modern theme that developers can use to build Microsoft-style looking applications just by switching to the new theme. It features the high padding, no-gradient, sans serif style that’s perfect for building Windows 8 and Windows Phone 8 applications. It’s pretty eye-catching, definitely check it out. 우리는 또한 개발자들이 새로운 테마로 바꾸는 것 만으로 마이크로소프트 스타일 어플리케이션 제작에 사용 할 수 있는 새로운 Windows 8 스타일의 모던 테마를 만들었습니다. 이 새로운 테마는 패딩을 높게주고 그레디언트 효과를 뺐으며 윈도우즈8이나 윈도우즈폰8 어플리케이션을 구축하는데 적격인 스타일을 특징으로 한다. 꼭 확인해 보세요 상당히 눈길을 끌겁니다. We encourage you to try out the various built-in themes by using the “Theme” option in our Kitchen Sink demo app. Also check out our theming guide. Kitchen Sink 데모 응용 프로그램의 “Theme”옵션을 사용하여 우리의 다양한 기본 테마를 시험해주세요. 또한 우리의 테마 가이드를 참조하세요. For a full list of available iconCls’s available, please refer to the Ext.Button class documentation. 사용할 수 있는 iconCls의 전체 리스트는 Ext.Button 클래스 문서 를 참조해주세요. List DOM has been dramatically streamlined. Almost all Touch apps use a list and with the lighter DOM, scrolling will remain fast even as your list and templates get more complicated. List DOM은 매우 부드러게 되었습니다. 거의 모든 Touch 앱들은 리스트를 사용하는데 DOM은 더 가벼워 져서, 여러분의 리스트와 Template들이 더 복잡해져도 스크롤링은 여전히 빠르게 동작 할 것이다. The showfps debugging option lets developers see how fast Touch is rendering and will help you see when your application’s design is outpacing the performance of the device. showfps 디버깅 옵션 덕분에 개발자는 Touch가 얼마나 빨리 렌더링하고 있는지를 확인할 수 있으며, 응용 프로그램 디자인이 장치의 성능을 능가하는지 확인하기 쉬워집니다. Today we also released an update to Sencha Architect 2.2 that includes support for Sencha Touch 2.2, thus instantly allowing our Architect users to become Touch 2.2 developers. Architect can help build your next great Touch app, and if you have an existing Architect+Touch project, you can easily upgrade it to a Sencha Touch 2.2 project. Architect makes it easy to switch between the new built-in Touch themes. 오늘은 Sencha Architecht 2.2 업데이트도 공개했습니다. 거기에는 Sencha Touch 2.2 지원도 포함되어 있으므로, Architect 사용자는 동시에 Touch 2.2 사용자도 될 수있게 되었습니다. Architect에서 좋은 Touch 응용 프로그램을 생성 할 수 있도록 도와줍니다 그리고 만약 기존 Architect + Touch 프로젝트가 있으면, 그것을 쉽게 Sencha Touch 2.2 프로젝트로 업그레이드 할 수 있습니다. Architect를 사용하면 새로 포함 된 Touch 테마 사이를 전환하는 것도 더 쉬워집니다. Go ahead and take Sencha Touch 2.2 for a spin: try the Sencha Touch Bundle, which includes Sencha Touch, Sencha Touch Charts, Sencha Eclipse Plugin, and Sencha Architect; or download the free standalone Sencha Touch SDK. It’s available with a 30-day trial, so feel free to download it and give it a go: it gives you everything you need if you are serious about building great touch apps. 어서 Sencha Touch 2.2 를 사용해 보세요. Sencha Touch, Sencha Touch Charts, Sencha Eclipse Plugin 그리고 Sencha Architect 를 포함하는 Sencha Touch Bundle을 사용해 보시거나 무료인 단독 Sencha Touch SDK를 다운로드 받아 보세요. 이것은 30일 시험 기간이 있으니 다운로드해서 무료로 체험 해 보세요. 여러분이 훌륭한 터치앱 만들기에 대해 심각하게 고려하신다면 여러분이 필요한 모든것을 제공 합니다. Aditya is Sencha’s vice president of product marketing and is responsible for the product planning and strategy for Sencha’s product lines. Prior to Sencha, Aditya held various senior product management roles at Adobe and Microsoft, focusing on developers and media in the mobile and consumer electronics space. « [십시일반 번역팀] SenchaCon 2013 자료를 번역 합니다. 여러분의 참여를 바랍니다. » Eclipse 에서 Sencha 때문에 Building workspace 에러 발생 하시나요?